To kick off our Christmas in July, how about a giveaway? I am so excited to share the work of this very talented jewelry designer with you! I just love RoseGirl Creations' jewelry! Amy takes obvious care with every design, putting in painstaking detail. She has pieces for any occasion and taste. I recently bought a couple pairs of earrings from her myself and they are stunning! I immediately put one pair on and wore it out on a date night with my husband. They have quickly become one of my favorites! Here are just a few of her lovely pieces! 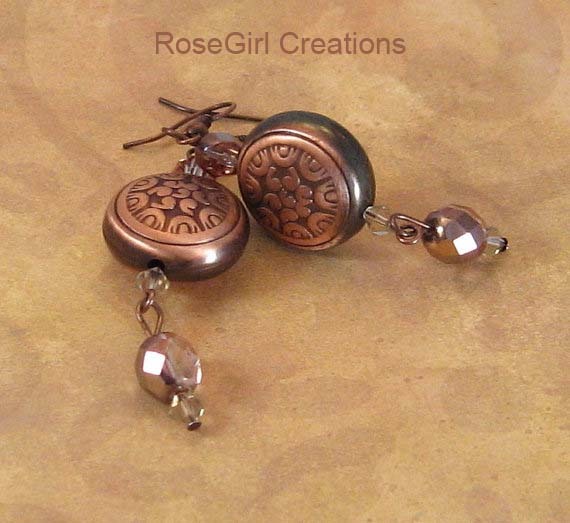 These beautiful Antique Copper Medallion earrings are perfect for everyday wear. The Swarovski crystals add a great sparkle! This fun and funky bracelet strikes a great balance between the large glass beads and the smaller crystals and silver beads. This piece would complement any outfit, whether you're heading to work, to hang with friends, or for an evening out! These pink firepolished crystal and pearl chandelier earrings are dramatic but so feminine! They would certainly make any outfit feel special! 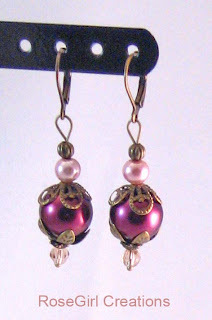 RoseGirl Creations has graciously provided me with this beautiful pair of earrings to give away! These vintage-inspired earrings are measure approx 1 3/4" from top of earwire. Antiqued-brass Lever-back Earring Wires and antiqued-brass findings that are all nickel-free and hypo allergenic, 12mm Glass Pearls in Burgundy, 8mm Swarovski Crystal Pearls in Powder Rose and 4mm Swarovski Crystal Bi-cones in Silk. You can earn up to four entries to this giveaway. 1. 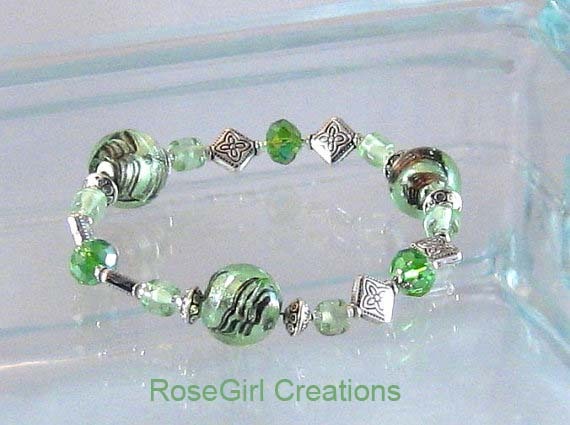 Go to RoseGirl Creations Etsy page and take a look around. Then, leave a comment here letting me know which of her designs is your favorite! 2. Go like the Christmas Rapping Facebook page and then leave a separate comment here letting me know that you have done so. (If you already "like" my page just leave me a comment to let me know). 3. Follow the Christmas Rapping Pinterest page and then leave a separate comment here letting me know that you have done so. (If you already follow me on Pinterest, leave me a comment to let me know). 4. Mention this giveaway in a blog post and then leave me a separate comment with the link! Last day to enter is Friday, July 13th at midnight EST. Winner will be announced on Monday, July 16th. Rules: Contest is open only to individuals in the US. Thank you again Vania - looks great!! I love the ones that look like mints. The red & white mints. Those to me just scream christmas. I know RoseGirls work is amazing. She made me a set before. A set of earrings, a braclet and a necklace. Too many to like! These are all gorgeous. I am in love with the Espresso Swirl earrings. Love the dark brown/turquoise combination. But the antique bronze ones you posted immediately caught my attention too! 1. I like these a LOT! So cute, and could go with so many things. 2. I already Like Christmas Rapping on FB! 3. I am now following all of CR's boards on Pinterest! 4. This is my wedding blog, so I'm going to instead post information about the contest on my Facebook page. Hope that's cool! Love the cobalt blue and crystal earrings but all of her stuff is gorgeous!!! Done! I did not know you had this... How wonderful! They are all beautiful! Like the amber/gold/champagne for Fall especially! I really really like the Amethyst Crystal Chandelier earrings! Beautiful! Yay! Thank you! I have the contest pinned on my Pinterest page if you want to just re-pin it from there. Look under the "Giveaways" board. I just reorganized my boards to put the Giveaways board on top and therefore hopefully easier to find/see! Espresso Swirl Lampwork Glass Bead...love this. I bet we could all find matching jewelry for a wedding we know about. I "liked" your page; still do! 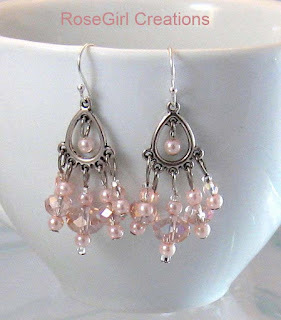 "like" you, "following" you and I love the pearl/crystal earrings from RoseGirl. Yay - I am so happy people are liking my jewelry!! I do custom orders as well!! Cannot wait to see who gets the give-away pair! I love the Teal. Aqua, & Lime Green crystal and ornate silver chandelier earrings! Love the Orange sherbet Moroccan inspired. They would be a great gift for my best friend.